There are three versions of Winchester’s Super X (now shortened to the SX). The Super X Model 1 semi-auto first appeared in 1974. 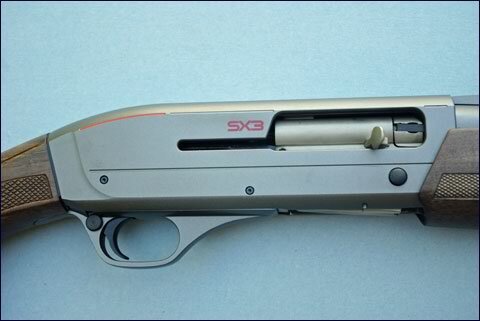 This was one heck of a shotgun, but production ceased in 1984 as the Super X was very expensive to produce because many of its parts were milled rather than stamped. The Model 1 is still seen often in competition circles. The SX2 was introduced in 1999. While this one took the lead-in name from the model 1 the second version was based on a totally different gas-operated system. The Super X3 (SX3), introduced in 2006, provided more innovation with overbored 12 gauge barrels, a lighter, sleeker profile, the new Active Valve System and more. For 2010 the company has just announced a 20 gauge version of the SX3, and that’s the semi-auto I have for testing. Winchester’s SX3 now offered in the new 20-gauge model. I’ve been banging away at clay targets with this 20 bore, and shooting this one has been pure pleasure. You would not want to shoot this gun at trap without a shell catcher attached – as empties are thrown a remarkable distance – so you wouldn’t want the trap shooter on the station to your right to get too battered by the wildly flying empties. On second thought I’ve shot with a few trap mates that I wouldn’t have minded that happening. Despite the empties flying 15 and more feet I was only shooting target-type loads. The SX3 20 bore worked flawlessly whether I was feeding it Remington Gun Club factory fodder – or my own Winchester AA reloads. 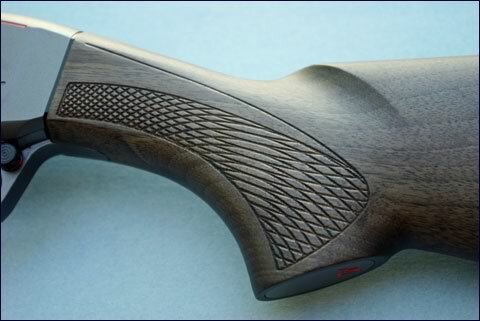 This SX3 20 gauge won’t hurt your eyes one bit as the gun is very attractive. The wood wears what looks a lot like traditional oil finish, and there are some nice grain streaks to add to the eye candy. 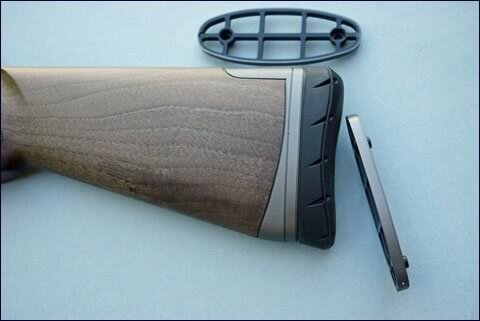 But it’s the receiver, barrel and trigger guard that wear a special grey finish that provides the additional eye candy. Of course, this finish is both scratch and corrosion resistant, far more so than traditional bluing, but the bottom line is how good the metal finish appeals cosmetically. The barrels, which have the Perma Coat UT (the UT for Ultra Tough) finish wear a somewhat high vented rib (also in that Perma Coat finish), and it measures .237 in width and is nicely serrated horizontally on top for glare reduction. Those serrations match up with the top of the receiver and its forward-running grooves. The receiver, also in grey but with a nickel protective coating, has some milled-away lines for added eye appeal, plus milled away lines near the receiver back are in red. Further, Winchester is in red on the left side of the receiver while SX3 is in red on the right side of the receiver. The bolt has a grey finish as well, and it’s probably tumbled in beads to result in its non-glare look. View of the right side of the SX3 20 gauge receiver. The safety is positioned at the rear of the trigger guard, and it can be switched for left-hand use. The trigger is a little heavy at six pounds on my Lyman Digital Trigger-Pull scale, but that trigger has no creep, and I shot several hundred targets with the gun before I checked the trigger with the Lyman, and I considered the trigger pull to be just fine. Then again I’m not a fan of light triggers on my shotguns. That’s probably because I mistakenly increase trigger pressure as the target is flying, so a light trigger often goes off on me before I’m actually ready. Both 26- and 28-inch barrels are available. My test gun’s barrel is the shorter of the two. A non-overbored 20 gauge would have an inner diameter of about .615. The SX3 test gun’s barrel measures .630 – so it’s well overbored by about .015 compared to 20s that have standard bores. Naturally, the gun comes with screw-in chokes. I measured the Improved Cylinder at .622 – so .008 constriction – the Modified at .617 – so .013 constriction – the Full at .603 – so .027 constriction. Two weight-saving factors are a lightened magazine tube and a slim fore-end. The latter hefts 5.8 ounces. It’s nicely checkered. Note the photos depicting the different checkering on the bottom of the fore-end compared to the checkering on the fore-end sides. This fore-end has finger grooves, but the depth of those finger grooves is very minimal – might not even show up in the accompanying photo. The checkering on the fore-end transitions from one type of checkering to another – from sides to bottom. 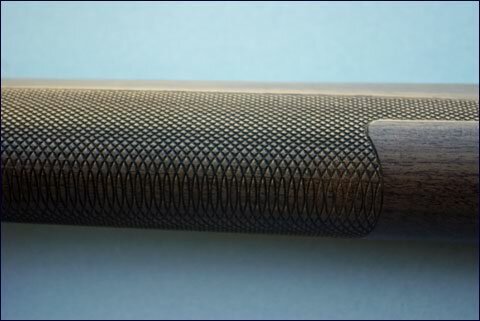 The very different checkering pattern on the SX3 20-gauge pistol grip. In contrast the checkering on the pistol grip is totally different. Again – see grip photo. Despite the differing looks I thought that checkering provided a good enough grip. The recoil pad is a Pachmayr Decelerator, but note the grey plastic in front of that pad – with grey portions extending forward at both top and bottom. Maybe this is added eye candy, and I like the looks. Length of pull is 14.25, but Winchester packs two extra plastic inserts with each gun – each insert measures .25 – and one or both can be added between the recoil pad and the grey portion just ahead of the pad – providing a choice of 14.50 or 14.75 in length of pull. The drop at comb is 1.62, the drop at heel 2.0. Overall the gun went 6 pounds 10 ounces on my digital postal scale. Note the inserts supplied with this SX3. Insert between the recoil pad and the grey portion. The insert’s weight is next to nothing. Each is .25-inch thick. It does not appear that the forcing cones have been lengthened. The fore-end screw cap is partially hidden in the front of the fore-end. Knock two retaining pins out for easy removal of the trigger system and subsequent cleaning. You should not feel the need to do this very often – perhaps after hunting in the rain or snow or at the end of the hunting year. A set of extra spacers are provided – that fit between the front of the stock and the rear of the receiver – to change the amount of drop at comb and cast. This is a very desirable feature that more and more semi-autos are being supplied with, and it’s a feature that every owner should experiment with to see which of these spacers allows him or her to print the shotgun’s pattern exactly where he or she is looking. Check the new SX3 20 gauge out at your Winchester dealer. You’ll be pleased with this gun’s good looks, and when you shoot it you will find it passes the ultimate test for an autoloader – it works. Thanks to Shotgun Life for this post. If you are a shotgun fan then you have to check out Shotgun Life online – Click here to visit ShotgunLife.com. Nick Sisley has been writing about the outdoors full time for over 40 years. He is a Level I NSSA and NSCA instructor as well as an NRA Certified Shotgun Instructor. Nick has written thousands of magazine articles, authored eight books, and traveled the globe in search of story material, usually with a shotgun. He can be reached at nicksisley@hotmail.com.